5 Ski areas are located within 10 minutes drive! 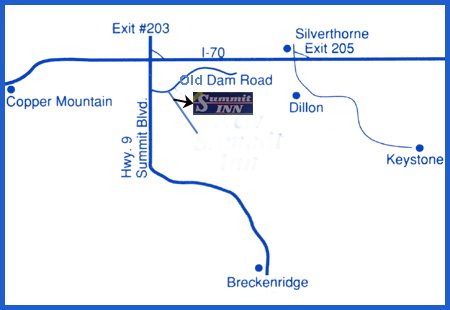 Take exit for Breckenridge/Frisco, exit #203. Turn left through the round about on CO 9 South which is N. Summit Blvd. Go one block on Old Dam Road, turn right onto the first paved road. Turn left at the Summit Inn sign.